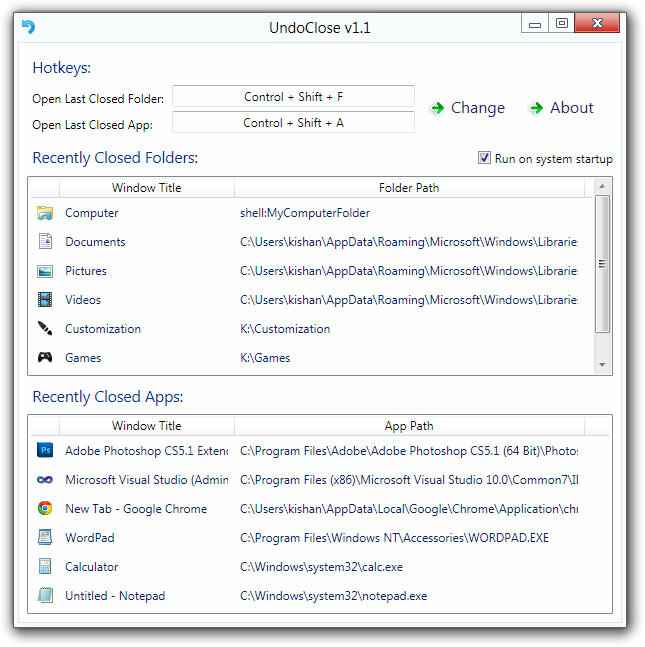 UndoClose is a free portable tool for Windows that allows you to reopen the applications or folders you have closed using two user-defined keyboard shortcuts. Run the tool and it will stay in the system tray. Click on its icon to open the Settings window. If you want the app to run whenever Windows starts, check Run on system startup. To change the default hotkeys, click on the hotkey which want to change, type the hotkey (Keys only from A-Z and F1-F19 can be set with a modifier key : Windows/Control/Shift/Alt) and click Change. The app will also list the apps and folders in two different lists. If you double-click on any item in the lists, the app will open it. To close the app, right-click on its tray icon and click Exit.